Accommodation & meals €20/25 per day inclusive. Plus donation - see info flyer. 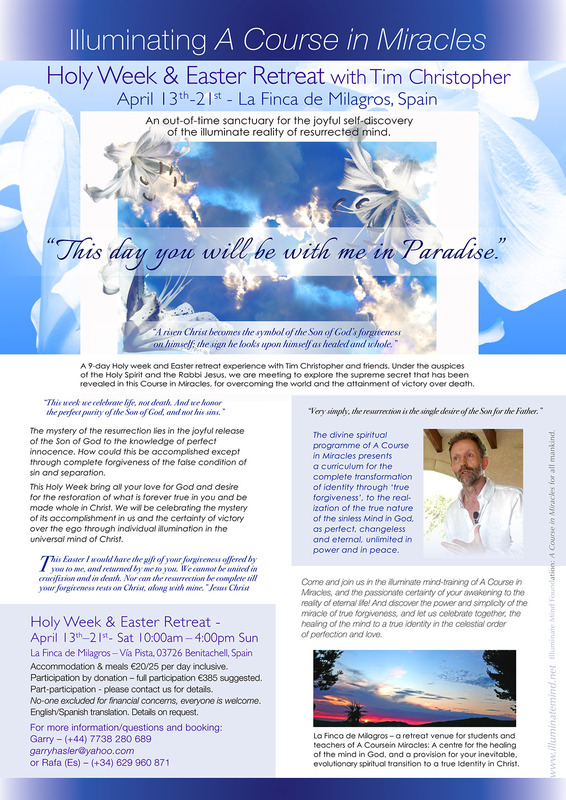 A 9-day Holy week and Easter retreat experience with Tim Christopher and friends. We are meeting under the auspices of the Holy Spirit and the Rabbi Jesus, to explore the means given us for overcoming the world and the supreme secret that has been revealed in this Course in Miracles, for attaining victory over death. “This week we celebrate life, not death. And we honor the perfect purity of the Son of God, and not his sins. Complete forgiveness, ‘true perception’ and Salvation through the acceptance of the Atonement, are all synonymous for the teaching this Course employs to bring about experience of joining with Jesus in the resurrection to eternal life, and of illumination in the universal mind of Christ. “He seemed to be crucified beside you. And yet his holiness remained untouched and perfect, and with him beside you, you shall this day enter with him to Paradise, and know the peace of God… Such is my will for you and your brother, and for each of you for one another and for himself. Here there is only holiness and joining without limit. For what is Heaven but union, direct and perfect, and without the veil of fear upon it? Here are we one, looking with perfect gentleness upon each other and on ourselves. Here all thoughts of any separation between us become impossible. 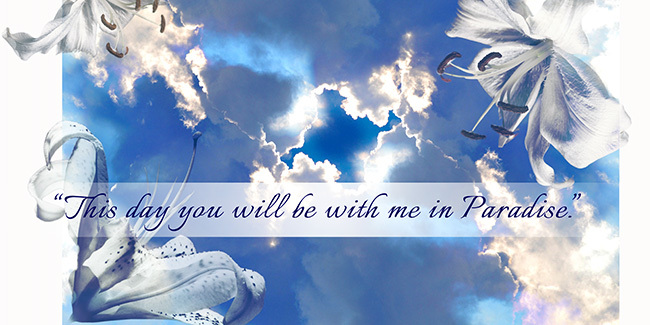 You who were a prisoner in separation are now made free in Paradise. And here would I unite with you, my friend, my brother and my Self.” T-20.III.10. To book please contact Garry (above). Una experiencia de Semana Santa y de Pascua de 9 días con Tim Christopher y amigos. Bajo la protección del Espíritu Santo y del rabino Jesús nos encontramos para explorar el supremo secreto que ha sido revelado en este Curso de Milagros, para superar el mundo y triunfar a la muerte. 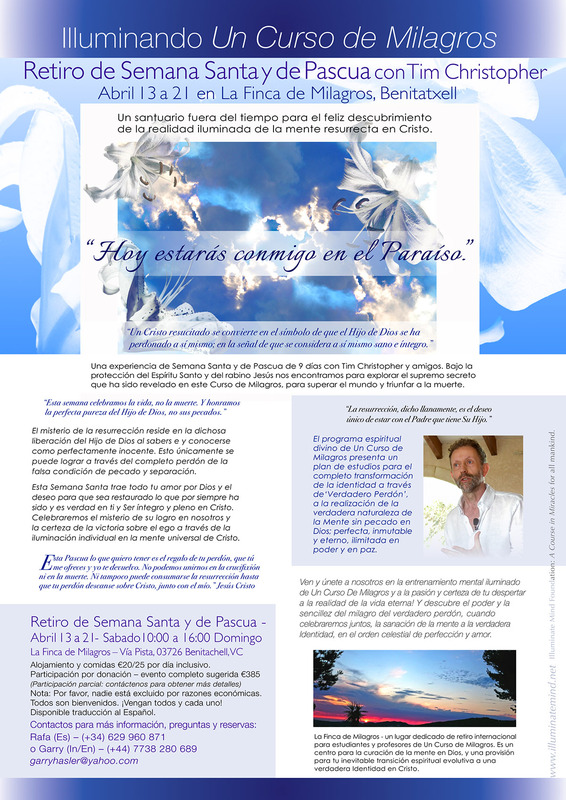 La Finca de Milagros is an out-of-time sanctuary for the inevitable spiritual transformation of A Course in Miracles. It is a centre for the healing of the mind in God, and a provision for your natural, evolutionary transition to a true Identity in Christ.